 Improved navigation of Molecule of the Month archive: new category views and a new sortable table to view features by category, date and name. 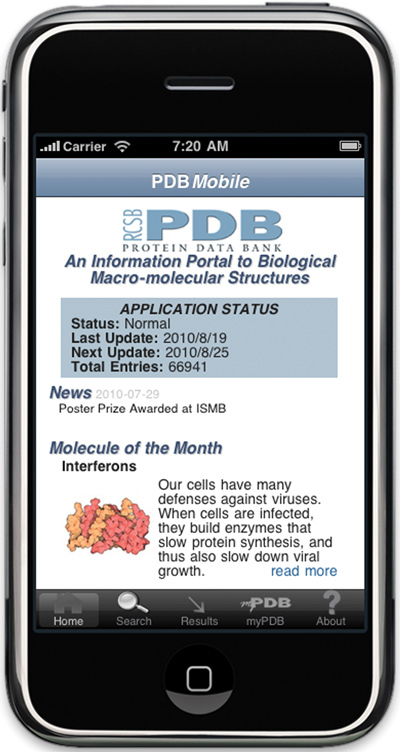  PDBMobile for the iPhone: search the RCSB PDB, browse results, access MyPDB, and read the latest news and Molecule of the Month features. 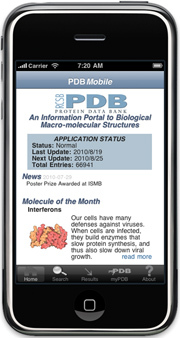 PDBMobile is an HTML5-based application for mobile devices. It initially targets iPhone and iPod devices running iOS4. Future releases will target other platforms, including the iPad, Google Android and Windows Phone 7.  New ways to explore search results using data distribution summaries. Search results now offer summary charts for standard characteristics of PDB entries (resolution, release date, experimental method, polymer type, organism, taxonomy) that can be used to refine search results into subsets of interest. For example, users can use these drill-down options, or 'faceted search' options, to quickly access high resolution entries from a structure type search; human-related entries from a sequence search; or most recent entries resulting from a chemical component search. Any combination of categories is possible.  Integration with Binding Affinity Data from BindingDB (www.bindingdb.org). The Ligand Chemical Component widget on a Structure Summary page lists and links to binding affinity data from BindingDB (when available).  New Help features, including a sitemap and glossary. For complete descriptions, see the New Features widget on the RCSB PDB home page. Data distribution summaries can be used to explore the latest weekly update of PDB entries or the entire PDB archive by clicking on the links in the top menu bar (In this example, it read As of Tuesday Sep 21, 2010 at 5 PM PDT there are 68139 Structures). Each chart can be used to drill down further, or to explore the entries in a given data distribution. 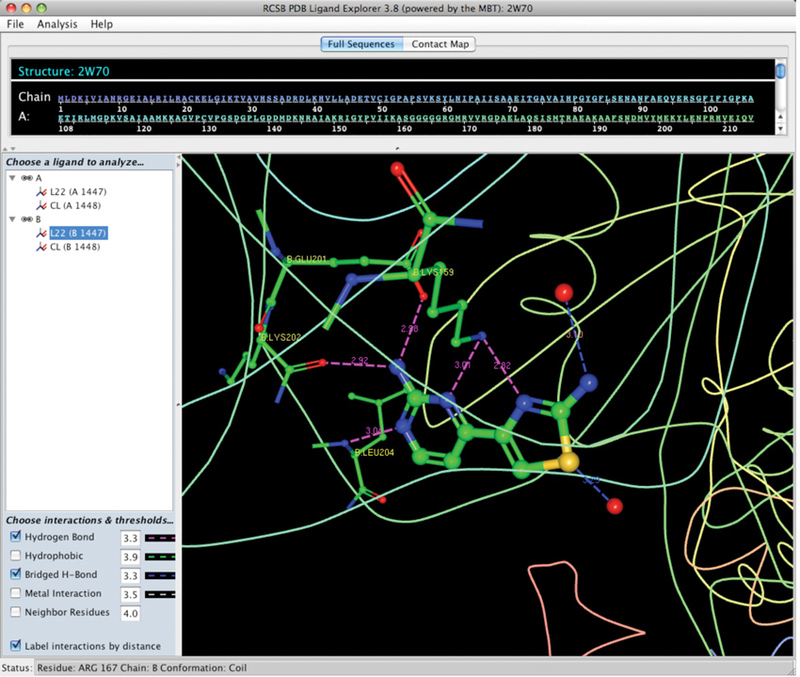 Ligand Explorer can display hydrogen bonds, hydrophobic interactions, bridged H-bonds, metal interactions, and neighbor residue interactions and thresholds in a dynamic viewer. Users can toggle interactions on/off, adjust distance thresholds, label interactions by distance, and display all neighbor residues. Distances, angles, and dihedral angles can be analyzed and measured. The views created can be saved as an image file, or as a text file listing interactions. Ligand Explorer can be accessed from the Ligand Chemical Component section of an entry's Structure Summary page. The program uses the same Molecular Biology Toolkit1 as the RCSB PDB's Protein Workshop and Simple Viewer. Launching Ligand Explorer can install a local copy of the program on your computer, and can be used to read a local PDB file, or access a PDB file directly using the File menu (when online). 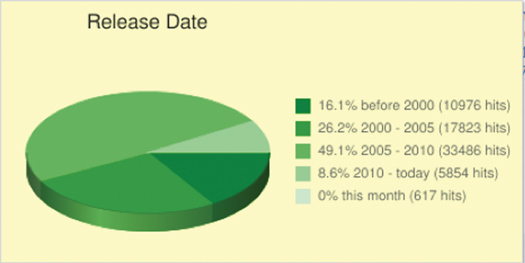 Website access statistics for the second quarter of 2010 are given below. The Molecular Biology Toolkit (MBT): A Modular Platform for Developing Molecular Visualization Applications (2005) BMC Bioinformatics, 6: 21.